Long before the modern deluge of organic soaps, herbal remedies, juice cleanses, and lifestyle brands like Gwyneth Paltrow’s GOOP, the mindful crowd had a medieval-era source for all-natural panaceas: the Officina Profumo-Farmaceutica di Santa Maria Novella. Roughly translated as the “Perfume-Pharmaceutical Workshop of New Saint Mary’s Church,” this world-renowned cosmetics and pharmaceutical company began its illustrious life as a community health clinic at a 13th-century Florentine monastery. Whether you were European royalty desperately seeking a cure for impotence or a working-class neighbor looking for the latest deodorant, Santa Maria Novella was the place to go. Established in 1221 on the outskirts of Florence, Italy, the Santa Maria Novella monastery was originally built alongside a small 9th-century church known as Santa Maria delle Vigne, or Saint Mary of the Vineyards, whose name evoked the site’s farmland setting just outside the city’s medieval walls. To soothe sickly parishioners in their quarter of Florence, an inventive group of friars began developing recipes for plant-based salves, tinctures, and perfumes designed to combat various ailments, from pregnancy to the plague. The friars’ earliest concoctions relied heavily on alchemy, a blending of scientific techniques with mystic and spiritual traditions. 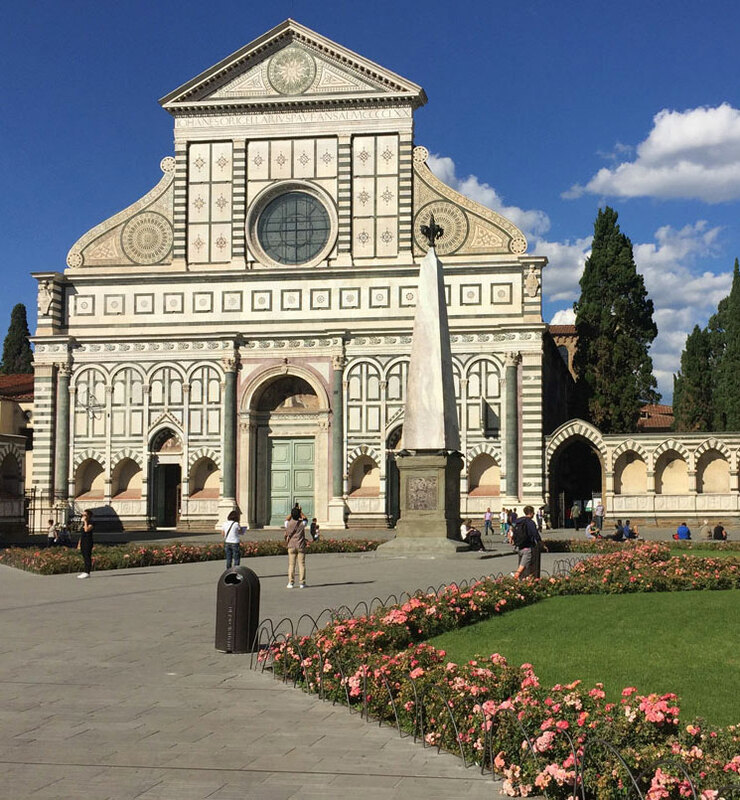 When the church was replaced by a much larger basilica, which was completed in the 14th century, it was renamed Santa Maria Novella (“novella” meaning “new” in Italian). But even as the city expanded beyond its walls, the friars remained focused on the natural world, cultivating native and exotic plants to use in their experimental medicines. Aside from a few short closures during the world wars, the business has operated continuously since its founding, supplying loyal customers with herbal remedies and natural cosmetics for more than 600 years. 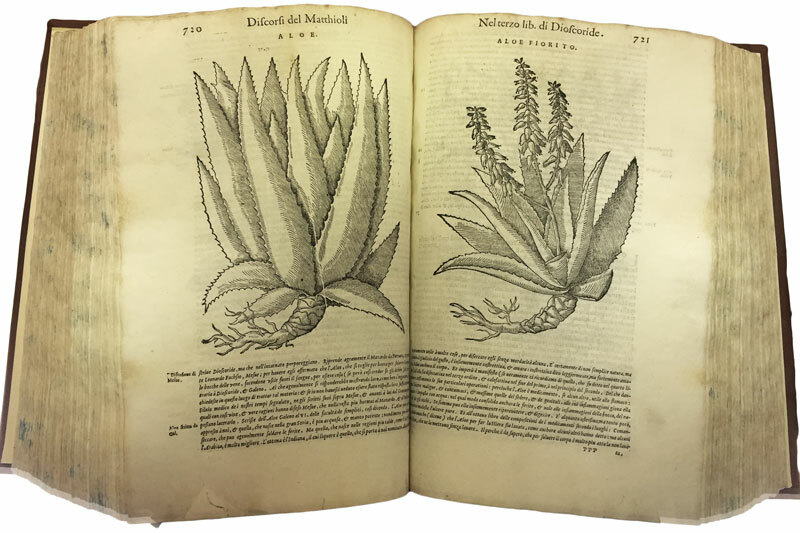 Top: The aloe plant as depicted in one of the monastery’s herbariums, which is more than 300 years old. 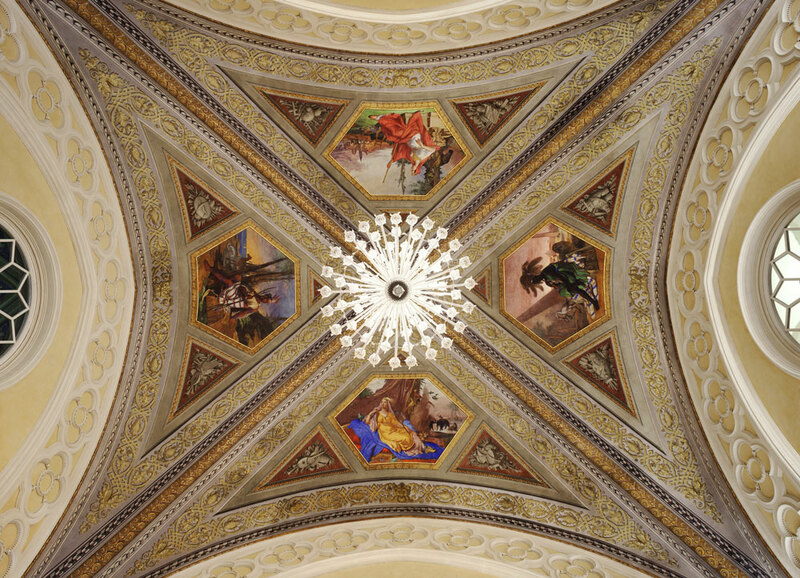 Above: This sales room at the Officina Profumo-Farmaceutica di Santa Maria Novella is housed in a converted chapel. 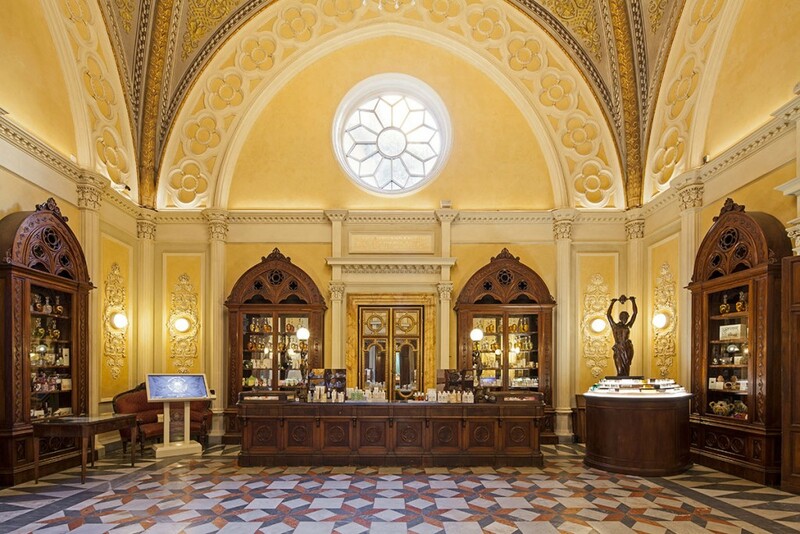 Gianluca Foà, the modern company’s Chief Commercial Officer, explains that two pivotal events changed the destiny of Santa Maria Novella’s little pharmacy. “First, in 1348, as soon as the plague epidemic came to Florence, the monks started trying to make something to fight this disease by turning to nature,” Foà says. Despite various attempts to combat the illness, more than half of Florence’s population was killed by the Black Death within a few years of the initial outbreak. The façade of the Basilica of Santa Maria Novella was completed in 1470. In 1353, as the city was reeling in the wake of this tragedy, Giovanni Boccacio wrote his famous book The Decameron, a collection of stories narrated by a group of young Italians sequestered from the sinister plague in a hillside villa outside of Florence. Isolation was the only reliable method for avoiding the Black Death, explains Diana Stefani, one of the current co-owners of the Santa Maria Novella cosmetics company. “In the monks’ book of recipes, one of the best recipes was to go and live on the hills,” Stefani says. “They also gave advice on changing the air in the rooms and carrying objects soaked with strong perfume,” the idea being that if you didn’t smell the plague, you wouldn’t get sick. At some point in their studies, the friars noticed that rose petals were resistant to certain pests, and concluded that distilling the petals would create a disinfectant that could prevent humans from catching the bubonic plague. “It didn’t work at all,” Foà says, “but by 1380, they had created this rosewater tonic, which is still one of our bestsellers.” Today, the company’s rosewater products based on this original recipe are sold as skin toner. Although many of the monastery’s medical treatments weren’t working as intended, the reputation of their cosmetic uses was growing. And a couple of centuries later, the modest apothecary lucked into a perfect brand ambassador without even trying. In 1533, Catherine de’ Medici—who belonged to the most powerful and influential family in Florence at the time—married Henry II, King of France, and became Queen of France. Already the region’s prime benefactor, Catherine commissioned the monks of Santa Maria Novella to create a unique fragrance to celebrate her wedding. “The monks melded the essential oils with alcohol—rather than olive oil, almond oil, or vinegar, like most perfumes at the time—because alcohol would transmit the perfume to the skin without leaving it oily or greasy, and wouldn’t go rancid,” Foà says. The Medici perfume soon made the pharmacy famous across much of Italy and France. As demand for their products spread to the far corners of Europe, the friars decided to open their pharmaceutical business to the wider public. 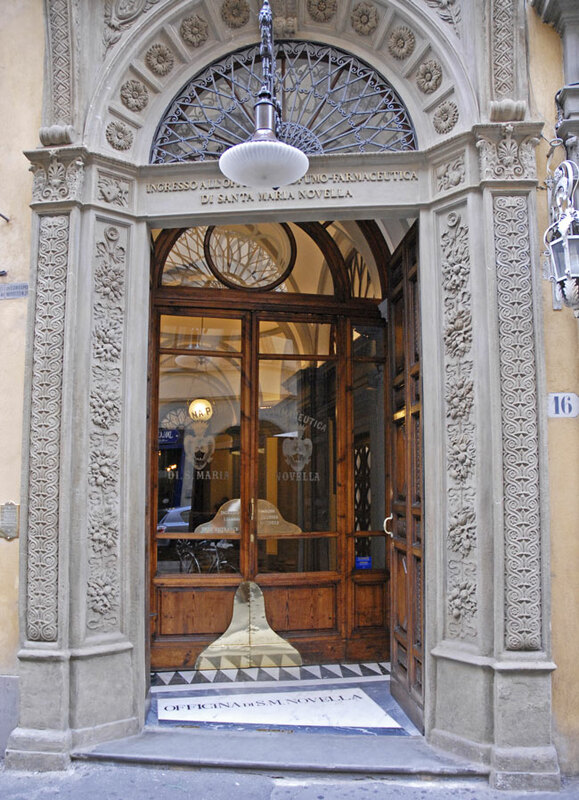 In 1612, under the leadership of Fra’ Angiolo Marchissi, the business officially became the Officina Profumo–Farmaceutica di Santa Maria Novella, and with the blessing of the Grand Duke of Tuscany, the shop bore the honorable title of “His Royal Highness’s Firm.” The shop’s entrance was off of the monastery’s central cloister and still catered mostly to local customers, though its prominence was steadily rising. “It became a very important place, not just from the spiritual point of view but also politically because the first floor housed the papal apartments at a time when the pope was considered a king at the helm of one of the world’s most powerful empires,” Foà says. 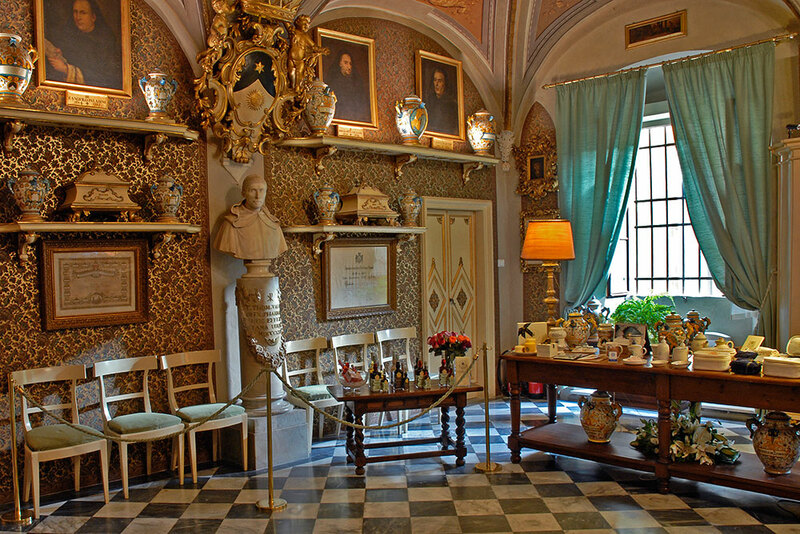 Today, the basement-level museum at the Officina Profumo-Farmaceutica di Santa Maria Novella holds several significant artifacts from the pharmacy’s earlier incarnations. 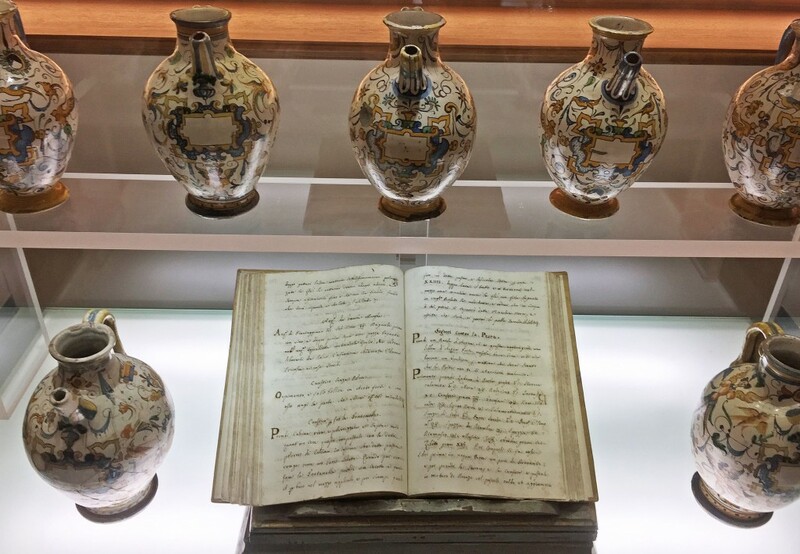 In addition to ceramic vessels for storing compounds and glassware used for distillation, the museum includes a few of the rare books utilized by friars centuries ago, such as the giant Herbario (or “Herbarium” in English), a bound taxonomy of plant specimens from the known world. Such records give a good idea of the various treatments the friars were providing. Though the retail space has been expanded into several rooms originally used for religious purposes, the original sales room is still in use, featuring authentic furniture, cabinetry, and ornamental details from the 17th and 18th centuries. Several of the apothecary’s early concoctions are also produced today, though they’re no longer prescribed for severe ailments. The original public sales room features historic displays of antique products. “The monks were trying to fix all these pathologies and illnesses, which eventually provided the basis for our modern cosmetics and liqueurs,” Foà says. A popular example is the deep-red liqueur known as Alkermes, based on a recipe developed in 1743 by Fra’ Cosimo Bucceli that includes cinnamon, cloves, cardamom, coriander, vanilla, and rosewater. “It was originally given to women after they gave birth to help restore them and ease the delivery pain,” Foà explains. “Now it’s used in a cake that we call Zuppa Inglese, a sort of trifle. Modern packaging of Alkermes uses antique label designs. One of the company’s most fabled products is Aceto Aromatico (or Aromatic Vinegar), which was known as Vinegar of the Seven Thieves in the early 15th century. “The story says that one part of the recipe was known by each of seven thieves, so they could only make the product when they were all together,” Foà says. “They used the recipe to protect themselves so they could rob people affected by the plague, but only when they were all together could they create it. Later, it was used as a cure for fainting. Back when our grandparents were young, it was very common. We called it the salts, as in, ‘Give me the salts!’” Today, the pungent liquid is sold as a stimulant and air freshener. Other traditional recipes include pastilles called Pasticche di Santa Maria Novella, an antispasmodic sedative called Acqua di Melissa (or Lemon-Balm Water), and the pharmacy’s signature calming tonic called Acqua de Santa Maria Novella, originally known as Anti-Hysterical Water. In the 14th century, amid the continued success of their pharmaceutical operation, the friars added two ornate chapels dedicated to St. Nicholas of Bari. In 1848, a new public entrance was built and the larger chapel was deconsecrated and repurposed as the main sales room, which remains its function today. 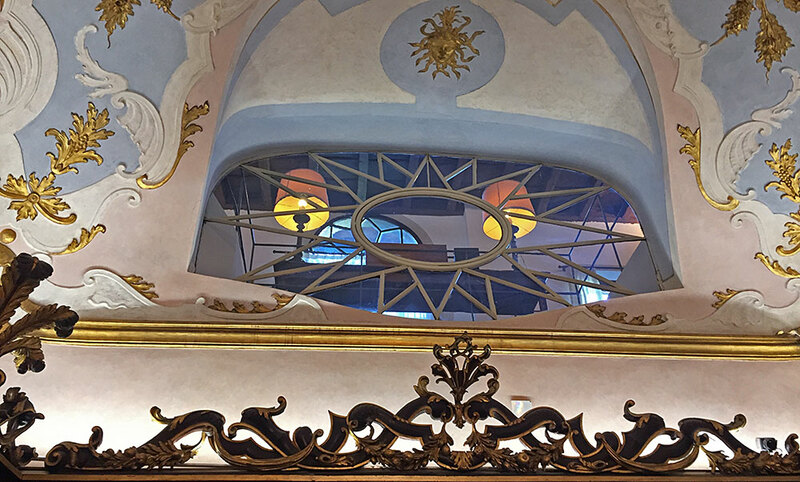 The smaller chapel featuring frescoes by Mariotto di Nardo is now used as a public reading room adjacent to the shop’s cafe and tea room. It’s easy to overlook the beautiful but understated main entry to Florence’s oldest pharmacy amid the city’s grandiose architecture. “The monks had to give ownership of the pharmacy building to the City of Florence,” Foà explains. “From that point on, laymen were managing the company, though the property is still under a long-term lease agreement with the city.” Although the management changed, Foà says the company retained its commitment to sourcing high-quality, natural ingredients for its time-tested recipes. This window connected the office of the rector, who oversaw Santa Maria Novella’s monastery, with the original sales room. 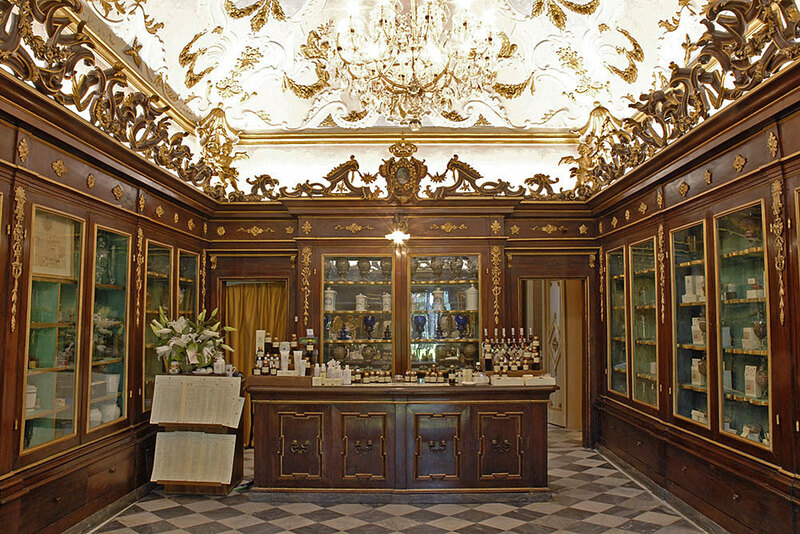 But even as technology, medicine, and urban life shifted dramatically, the Officina Profumo-Farmaceutica di Santa Maria Novella avoided short-lived trends and stayed faithful to its roots. Relying on centuries-old recipes, the company unintentionally discovered a different kind of alchemy—the recipe for success—in a world where wrinkles and body odor are more feared than the bubonic plague. I very much enjoyed the reading of the above text. I began my journey into the science of pharmacology and pharmacognosy in 1979. Passing the National Boards 2 months following graduation launched me into an endless field of manuscripts, herbal compounds, patent medications and a great assortment of glassware, balances, motor and pestle’s, brass weights and the like. Given my passion is anything pharmacy or medically oriented, my goal is always to find that prized container that has never been opened and still contains the original contents. At last count, I’ve collected over 500 cork stoppered bottles and tubes of dissolvable tablets ( with several kits for administration). Now retired after 32+ years of practice, I have 5 grandsons, and hope that my enthusiasm for the art my find itself in one of their heart’s. Happily my oldest son gained his doctorate in pharmacy (giving me 3 chances to advance the recovery of one of the oldest art documented. Having two sons and daughters in law that all have their masters degree or above, including my lovely wife, odds are very good that pharmacy and will not die in this branch of the Recktenwald’s. I wish you would please share the names of the early sources that you discussed, and who they are attributed to with dates. “ ” Over the years, her collection eventually grew to 250 or so pieces.